Rumour has it that there were a hundred fewer of these produced (out of not many to start with) so if you see one jump on it. (You never know, this could be the “Pingus” moment for this little gem of a wine.) I didn’t get my hands on Ube 2013 (not just once but twice in quick succession) until January this year but I have been waiting for this one ever since, picked it up last week and managed to wait nearly a full week before opening it. 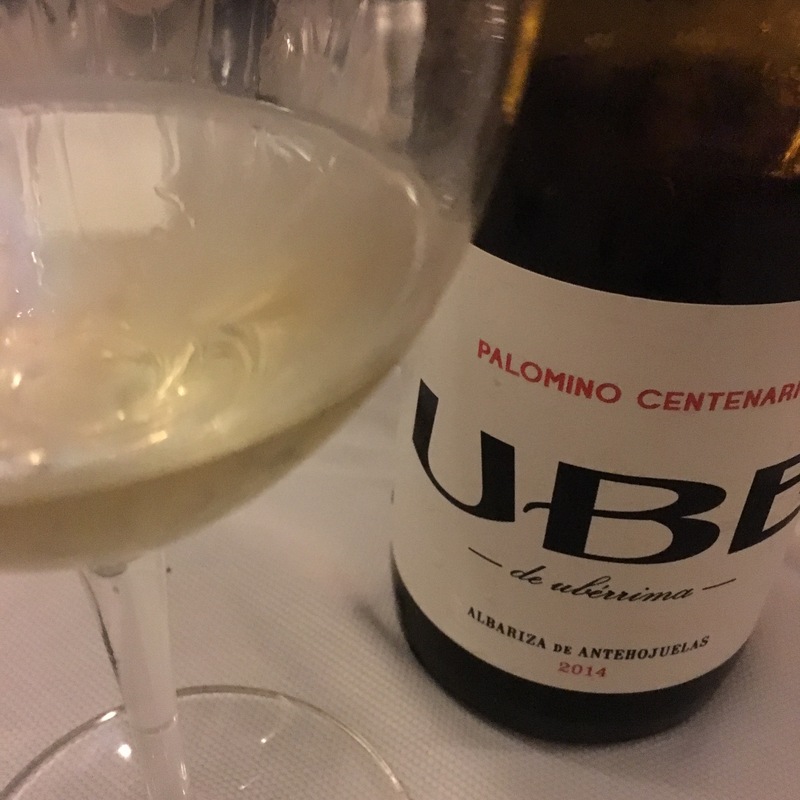 It is by Ramiro Ibañez of Cota 45 and the full name is “Ube de uberrina” (uberrina meaning “utmost”), it is an unfortified white wine labelled “Palomino Centenario” (100 year old palomino) and its label references the kind of albariza soil involved (albariza de antehojuelas), the vineyard (a small finca called Las Vegas), and the cepage (100% palomino but 73% palomino fino, 16% palomino jerezano and 11% palomino peluson). It was fermented and aged for fourteen months in a manzanilla bota – without flor but with a little air – in the tiny microwinery on Bajo de Guia in Sanlucar. The picture above doesn’t really show the wine off well – in the flesh and with more light it is a lively, crystalline gold with some green tinges, a very appetising sight indeed. The nose was very interesting – at the start it was a little timid and had a little reduction – something I found with the 2013 too-, so I would definitely recommend opening this 30 minutes or so before drinking. Once it got going it had a very interesting nose of baked apples (one of the guys called toffee apples), chamomile and, as it opened up, more powerful herbal aromas, even savoury and meaty. On the palate it has a chalky texture and some salinity – not the full zing of a manzanilla but a tingle, mouthwatering and warming on the tongue. In flavour terms it has a quiet, elegant entry but then it is a little flavour bomb. If sapid is the antithesis of insipid then this was sapid squared – in part due to its salinity, but also to the baked apple and then herbal flavours – a mix of chamomile, rosemary and oregano. Not the longest finish in the world but a nice defined, ball of flavour – I must admit I didn’t remember the 2013 being as flavourful. This really is good – probably the best unfortified palomino I have had yet. I just wish he would make more of it (and I am not referring just to the 100 missing bottles).